First let me give you fair warning. This one has excessive language. Often very offensive language. Obscenities, profanities. So why on earth am I featuring it? Because for mature readers, it offers a very honest, hard look at prejudice. Bone by Bone by Bone takes place in Tennessee in the 1950’s. David Church is the son of the town doctor, a paradox of a man who cares tenderly for sick and dying Whites but has an obsessive hatred for Blacks. His temper is harsh and shifting, and David is never sure which father might show up at any given moment. In fact, he’s not sure his father isn’t part of the Klan. But when David befriends a black boy by the name of Malcolm Deeter, he knows how his father would respond. The boys’ antics are a well-kept secret—for a while. But as they grow up, friendship between Black and White becomes much more difficult in a society hell-bent to keep them apart. And when Dr. Church does find out about the friendship, he threatens to shoot Malcolm if he ever steps foot in his house. And as David finds out, he wasn’t joking. 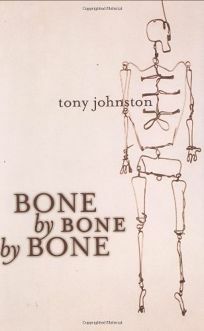 Bone by Bone by Bone is compelling. It’s not a book I love, but it is a book that teaches. The relationship between David and Malcolm is a beautiful thing, and the author’s skill is considerable. It’s written for middle grade, but because of the excessive language and some really hard topics, like a Klan murder of a black character, I’d probably wait a few years on that. So, I’m giving a 14+ age recommendation on this one. Apparently, Bone by Bone by Bone is not available as an ebook, but here’s a look at hard- and softcover versions on Amazon. This sounds like an emotionally hefty read. After your description, I was a little surprised to hear it was set for middle graders. I completely agree that it might be more suitable for older readers, but it also sounds like the language used helped define the character and forge the story deeper. You’re right, Sheri. It does both. If not, I never would have featured it. A deep thinker and a hard look at a real world, I still think it’s best for a slightly older audience. At least, I know my own middle graders aren’t ready for this one. I applaud your reviewing this book due to its content, despite your distaste for its language. Tough call sometimes, but worth it. Sort of like those movies like Schindler’s List or The Patriot. You know, the ones that have something to offer dispite their graphic portrayal of a very fallen world. I’d really like this book. Excellent review. Sounds like a book for a little older group. Sharon Draper touched on the Klan, a hanging, and beatings in her MG novel Stella by Starlight. But, the language was appropriate. I’m not a huge Sharon Draper fan, but I would really like to read Stella.